The CFP Board has been in the news recently regarding its Rules of Conduction and the requirement of disclosing accurately how an advisor is compensated. At issue are cases where advisors claimed to be “fee-only” because they are part of a firm which is fee-only. They are neglecting to report that related parties such as the advisor’s employer or another family member stands receive the benefit of commissions based on the advisor’s selection of brokerage services or commission based products. 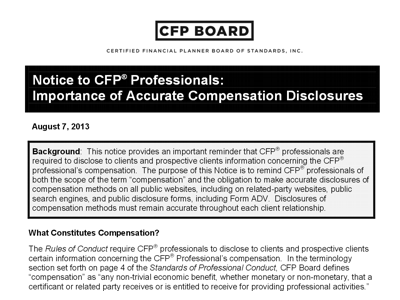 CFP Board does not define “salary” in the Standards of Professional Conduct. A CFP® professional is required to describe his/her compensation in a manner that allows clients and prospective clients to understand how they will pay the CFP® professional and any related party. Except in very limited circumstances, salary does not provide an accurate and understandable description of the compensation arrangement being offered by a CFP® professional because it does not describe how the client will pay the CFP® professional and any related party. Therefore, CFP Board will remove “Salary” from its “Find a CFP® Professional” search engine, effective Friday, August 16, 2013.